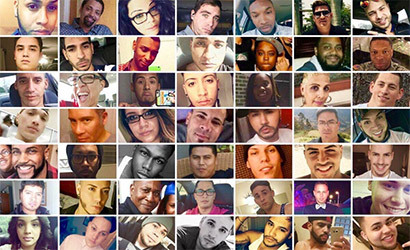 It’s been two years since the single biggest known massacre of LGBTQ people in modern history, in Orlando, Florida. On June 12, 2016, while patrons were celebrating Latin Night at the Pulse nightclub, 29-year-old Omar Mateen burst into the venue and opened fire on the crowd. A total of 49 LGBTQ people and their friends were slaughtered in cold blood and more than 50 were injured. After a three-hour standoff with the police, Mateen was shot dead by officers who forced their way into the club. 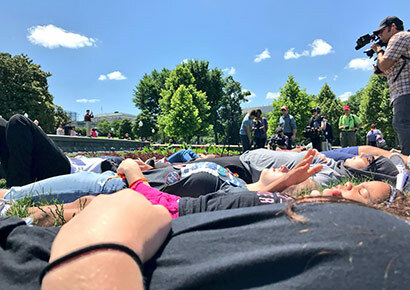 On Tuesday, the second anniversary of the tragedy was marked across the US with a series of “die-in” protests by the National Die-In campaign, a project led by student gun control activists. The most prominent event took place in Washington D.C., lasting 12 minutes and 720 seconds. “This number represents the approximate number of people who have died in a mass shooting since the Pulse Nightclub Massacre,” said the organisers. In a rally outside the Orlando City Hall on Monday, massacre survivor Brandon Wolf addressed the crowd. “Two years ago, I was washing my hands in a bathroom sink when I heard an assault rifle fire 45 rounds in one minute,” he said. The Human Rights Campaign (HRC), America’s leading LGBTQ rights groups, also spoke out in memory of those murdered and called for stricter gun laws in the US. “As our nation marks two years since this tragedy, we must never lose sight of the unfulfilled hopes, the families shattered and the love lost in this preventable act of mass murder,” said HRC President Chad Griffin. “The thousands more killed by gun violence since Pulse underscores the glaring failure of our elected officials to take common sense steps to combat the scourge of gun violence that plagues our nation,” he added. The motive for Mateen’s attack remains murky. Despite his statement that he was inspired by Islamic religious extremism and pledging allegiance to Isis during the shooting, no direct links to any group has been confirmed. Reports that he was a closeted gay man have also not been verified. The killer’s wife, Noor Salman, was accused of knowing that her husband was planning an attack. In March, she was acquitted of charges of aiding and abetting Mateen as well as obstruction of justice.